Serve it hot & enjoy! Oh My Word!! Just look at those glistening cashews just waiting to be eaten. bout to Go ahead and drool all over this dessert! I've already told you about "Namkeen" pongali which is made on Pongal as prasad. However, did you know that you can slightly change the recipe and make a sweeter version? Today is your lucky day. 1) Cook rice and dal together with 5 cups of water either in rice cooker or stove top. Select the cooker or container size slightly bigger to avoid water spillage. Use low to medium heat level for stove top cooking. 2) If using rice cooker, transfer the cooked pongal into a saucepan. Add milk, sugar, brown sugar and cardamom powder to the pongal and cook on low heat until it is well cooked and all the liquid is absorbed. Add 3 tbsps of butter and mix well. 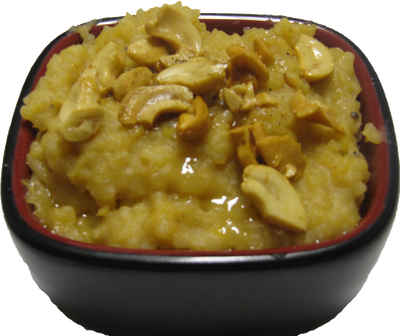 3) In a small pan, heat the remaining butter and fry the cashews to golden brown and mix it into the pongail. What a sweet treat!I came across your site from the foodieblogroll and I'd love to guide Foodista readers to your site. I hope you could add this basmati rice widget at the end of this post so we could add you in our list of food bloggers who blogged about recipes with basmati rice,Thanks! Now would this be served as a dessert? Yes it would, Medifast Recipes.